“Baby Wheel is an almost all-English hopped IPA* brewed by a Bostonian. All English hops in a Siren beer you ask? Well this is something we ain’t ever seen before, and we can’t wait to find out what you make of it. 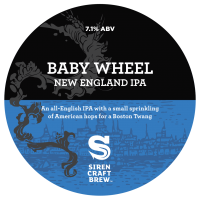 This one will be appearing in bars and pubs near you over the next week or so, bonus points to anyone who knows where ‘Baby Wheel’ gets its name!